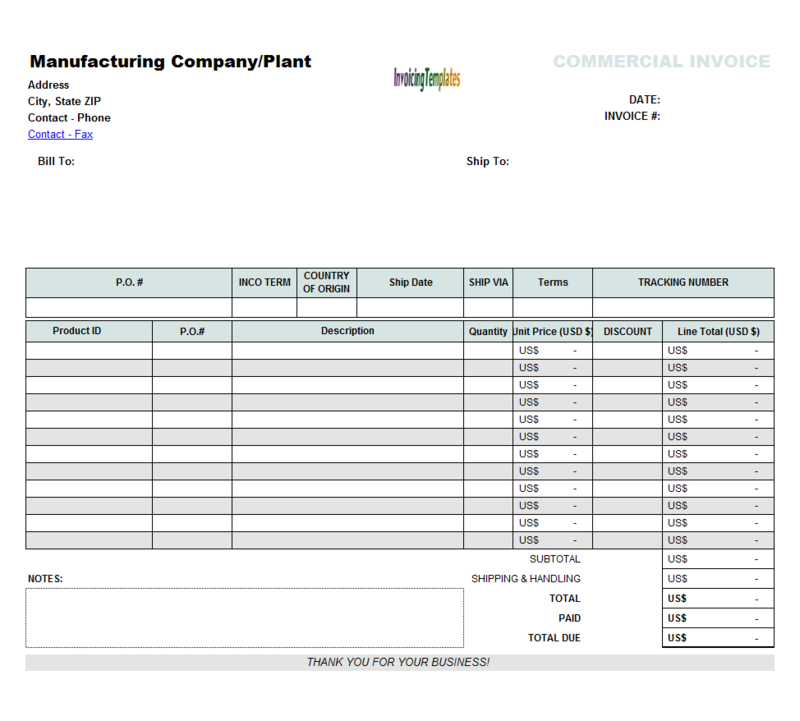 With the previous FedEx style commercial invoice samples the insurance cost and currency symbol fields were missed. 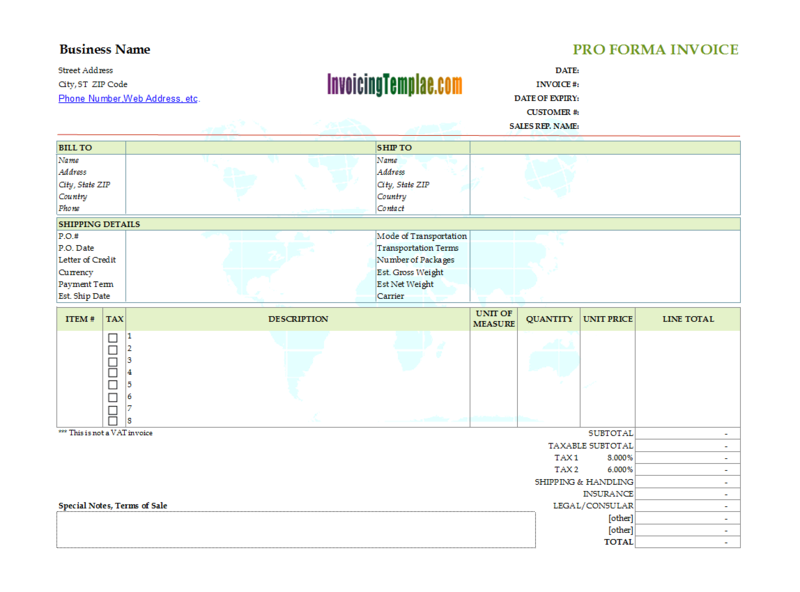 This template shows how to add it onto the printable commercial form. 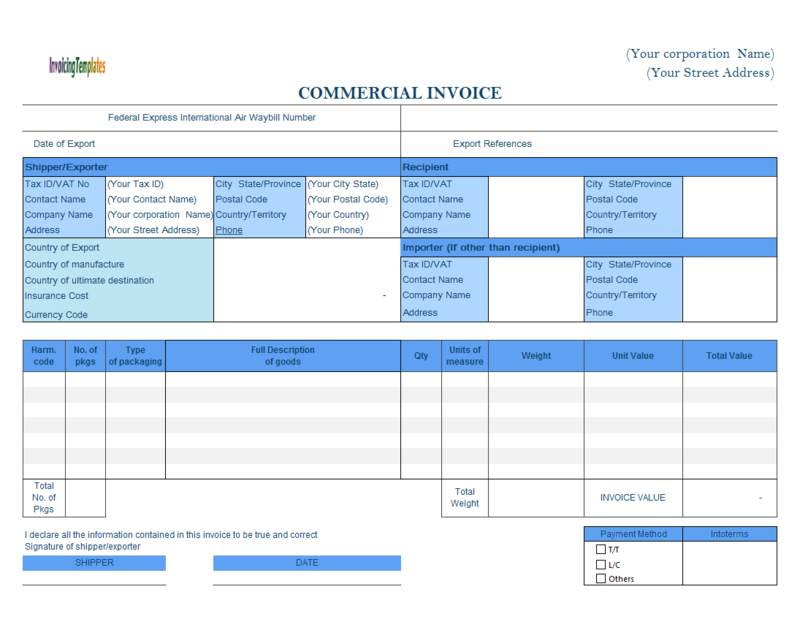 c9006 now includes the customized invoice template for the latest version of Invoice Manager for Excel. This is what you will see when you open commercial-sample-insurance.xlsx. 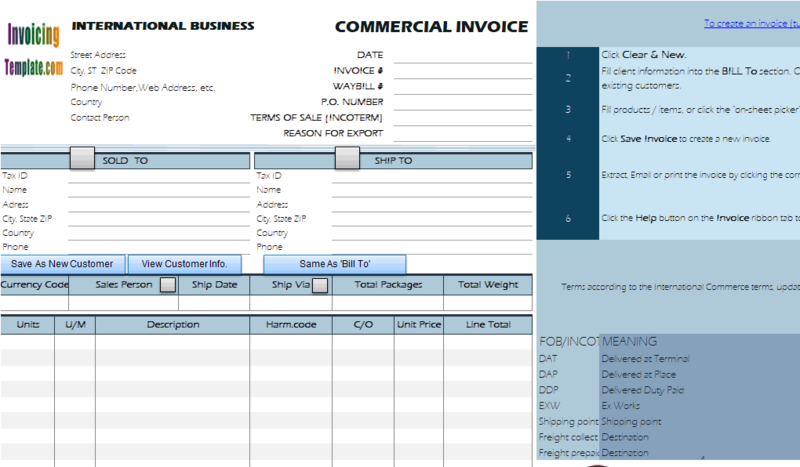 Some of the commercial and proforma invoice templates here on InvoicingTemplate.com already contain the insurance cost field, for example in Commercial Invoice Template (UPS Style) the insurance cost field was located near the bottom of the form, above the "Other" field; Simple Proforma Invoice Template has this field too. 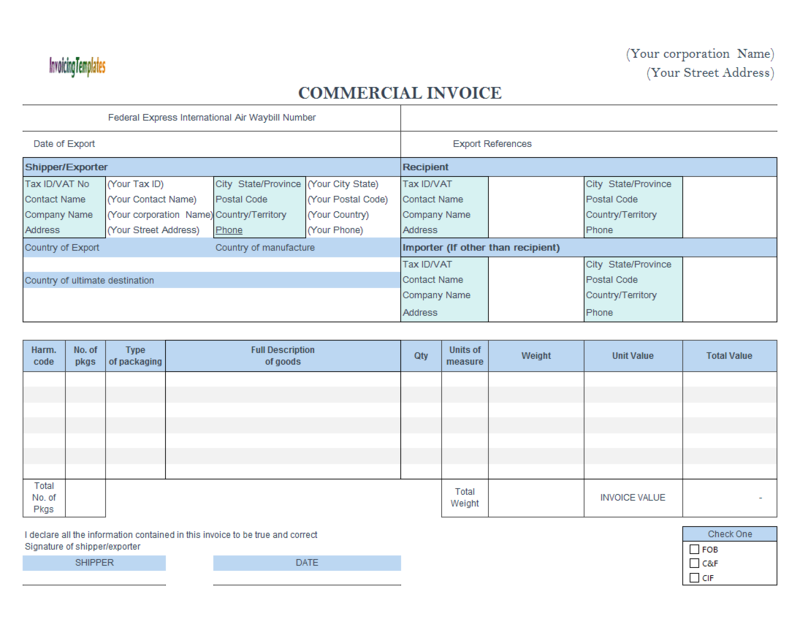 For the list of all the commercial and proforma templates here on InvoicingTemplate.com, visit Pro forma and Commercial Invoice Template. On the DHL style template, you'll find these fields too. 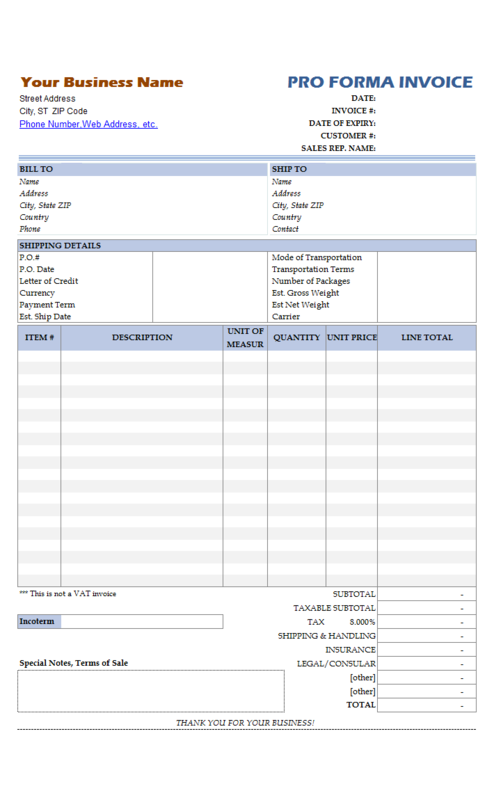 However in this serial of FedEx style Excel-format blank commercial templates they are missed. So how we add them? 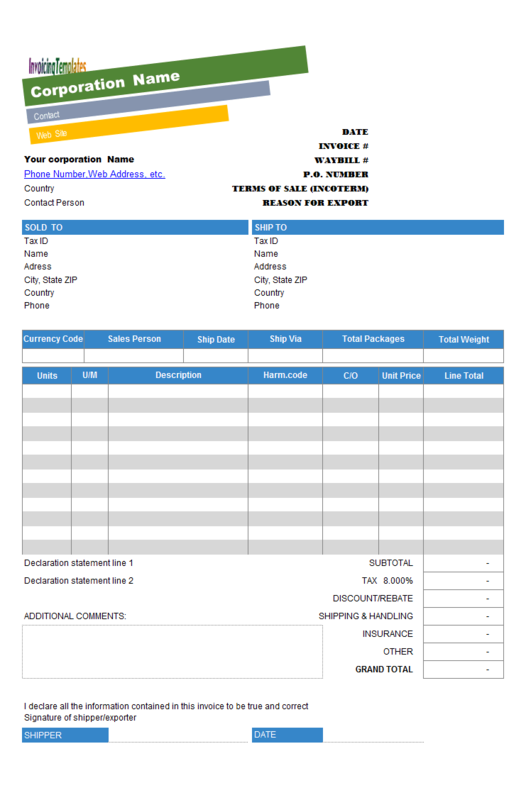 Unlike those invoicing templates in HTML, Adobe PDF or Microsoft Word format, it is relatively easy to add new fields to an existing invoicing form. This is true to OpenOffice spreadsheet templates too. 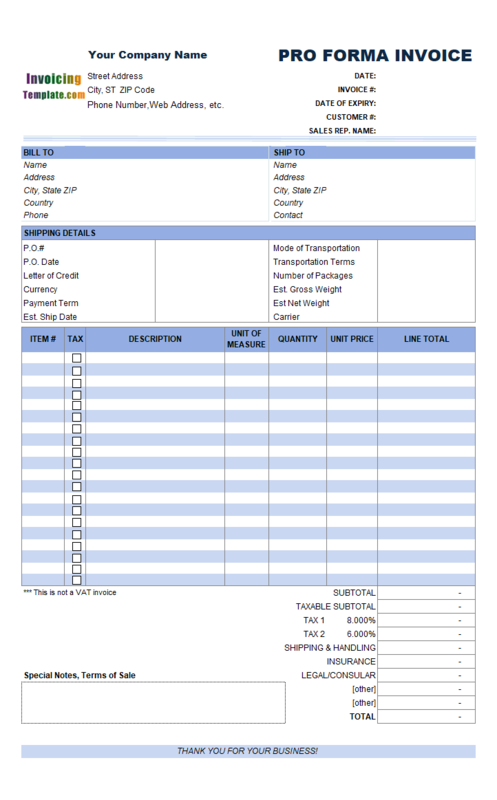 This reason is simple - with a spreadsheet format template, the space on the blank forms was divided into cells and fields naturally. To add a new field, simply look for a blank (not used) cell and type in the related information. Of course, if you want to include the new field on the printed versions / exported PDF versions, make sure the location of the new fields is within the range defined by Print_Area name - this name defines the printable form. Cell and contents outside this area will not be printed or included in the generated PDF documents. In this sample, we placed the insurance and currency cells F15:K15. This was done by unmerge the original "Country of ultimate destination" cell to make space for the new cells. We also rearranged the "Country of Export", "Country of manufacture" cells. By moving the fields and labels, we aligned all the content in the F13:K17 section to make the form look professional and beautiful. Be sure to unlock the cells so that even if the sheet is protected, the cells are still fillable. Your business grows fast. 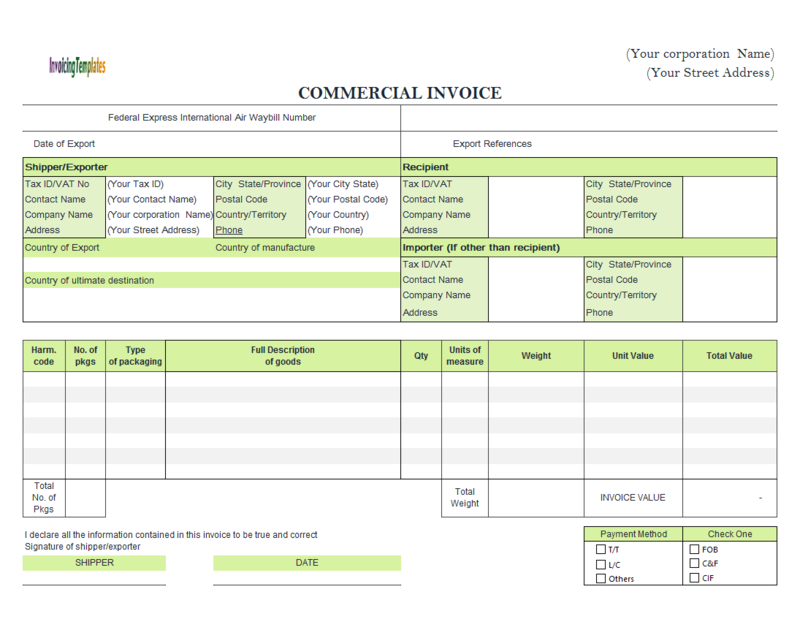 So you need a more powerful tool to handle your commercial invoices! 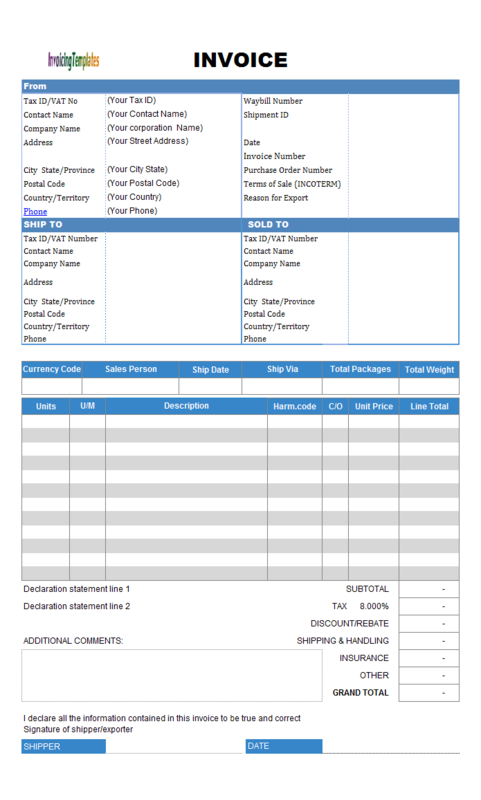 By installing Invoice Manager for Excel (namely Uniform Invoice Software), our Excel-based billing and invoicing software app, a simple Excel invoice template could be a complete invoicing system. 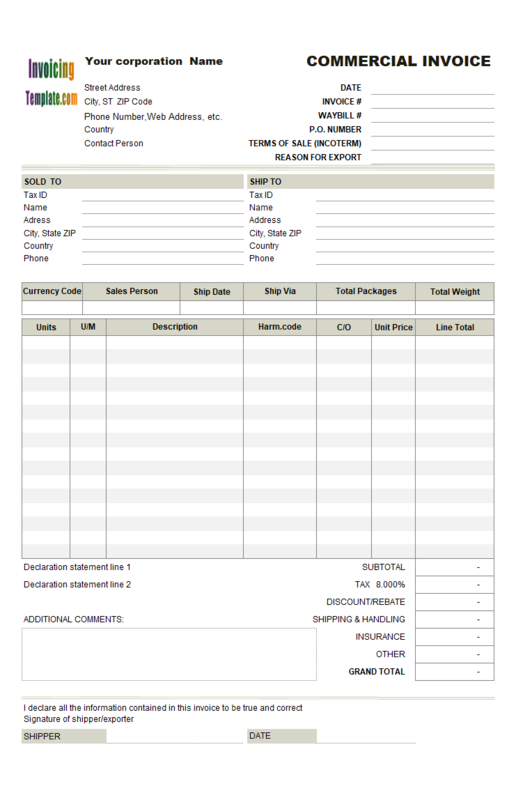 So how about the new fields added to a template, such as in this example, the insurance cost and currency code fields? No problem! 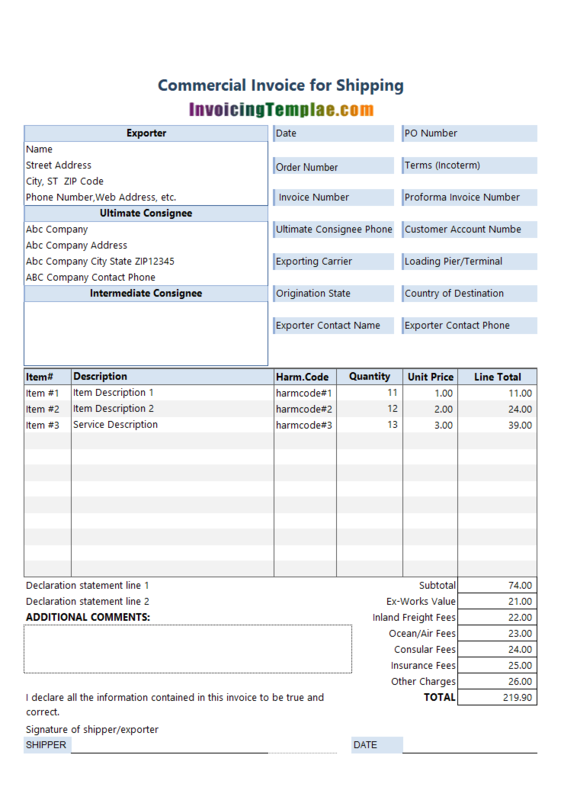 Invoice Manager for Excel (namely Uniform Invoice Software) (and even Excel Invoice Manager) support custom fields, which are user-defined fields added to both the template and database file. 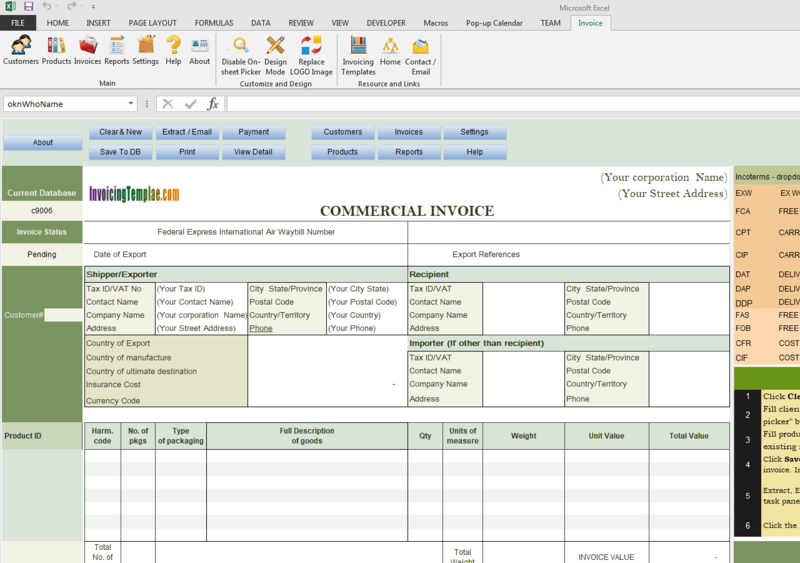 This, combines the power of Excel formulas, makes Invoice Manager for Excel (namely Uniform Invoice Software) flexible enough to handle many different invoicing forms and designs. In this sample, we've modified the formula of the Total Value cell from " =SUM(oknLineTotal_1:oknLineTotal_12)" to "=SUM(oknLineTotal_1:oknLineTotal_12)+oknInsurance". 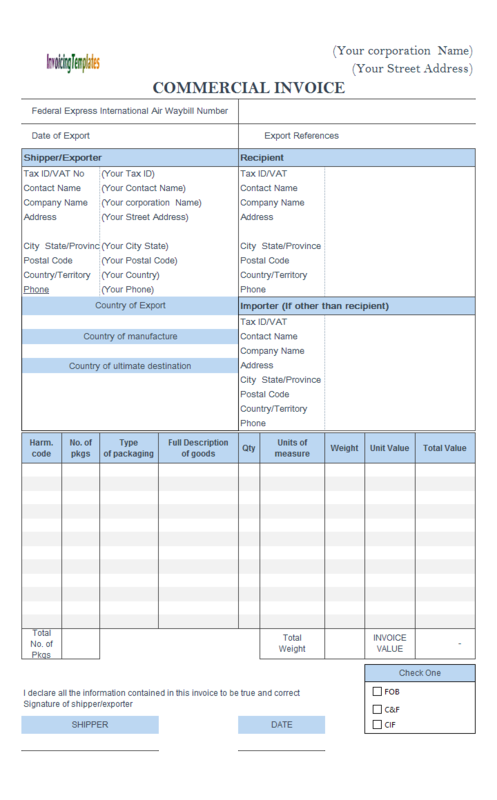 So in this free commercial invoice template, the total value includes insurance cost. 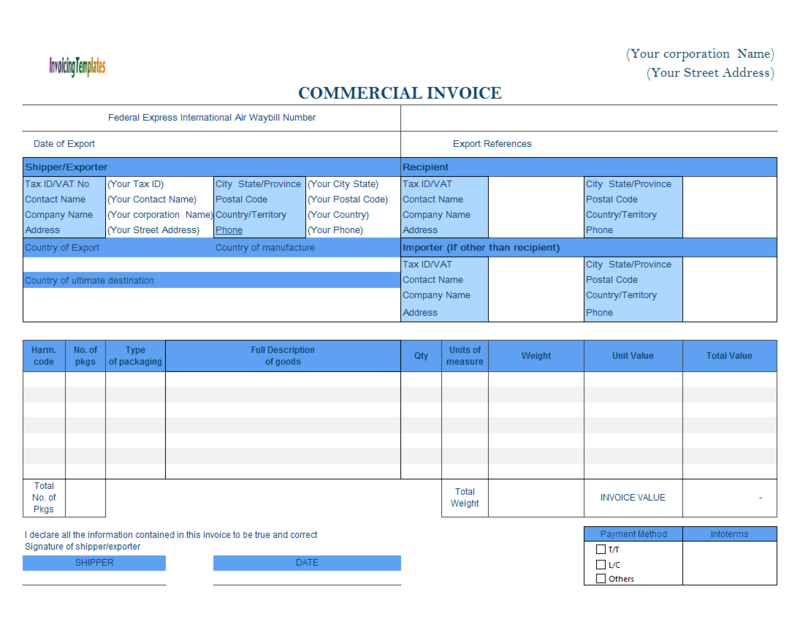 Like other form designs here on InvoicingTemplate.com, Commercial Template Format - Adding Insurance Cost Field is free (offered to you at a price of 0.00USD). It works on Windows XP and all newer versions of Windows, and Excel 2007, 2010, 2013 or 2016.